Brett Merchant and his half-wolf dog Kura have walked Highway 16 from the B.C.-Alberta border to Prince Rupert to bring respect to victims of the Highway of Tears. Brett Merchant and his dog have walked Highway 16 from the Alberta border to Prince Rupert for the victims of the Highway of Tears. The 1,236km journey on foot across the province is coming to an end for one man who has dedicated every footfall to the young women and men who have been murdered or gone missing along Highway 16. Rather than do the stretch of the Yellowhead Highway between Prince George and Prince Rupert — the section of the highway that has become known as the Highway of Tears — Brett Merchant decided to start from the B.C.-Alberta border and trek all the way to the highway’s end in Old Massett. On Oct. 19, Merchant’s walk was cut short at the 85km sign outside of Prince Rupert due to complications in his knee and ankle. He visited a doctor and will rest for a week before continuing on. “I don’t want to quit. It’s getting sad to come to the end,” he said. Merchant faces health issues as well, he has lupus, early onset of dementia and diabetes, but that has driven him to do the trek even more than it has deterred him from it. “Over time I just wanted to do something because I’m getting older and sicker and I heard of the Highway of Tears. Then I watched the documentary on Netflix. The day I saw that, probably within six weeks I’m on the road,” he said from inside the Prestige Prince Rupert Hotel lobby where he was put up free of charge for a couple nights. Most of his evenings have been spent in a tent with his dog Kura, a half-Siberian Husky half-wolf. Friends drove the pair from their assisted living home in Kimberley to the “Welcome to B.C.” sign near Jasper. On Sept. 1, they started walking. His sister, Cheryl Magis, was concerned about her brother’s plan but he brought a GPS Spot with him so the family can see where he’s at every day. “What can you do? He was going if I said ‘no.’ You can’t stop somebody if that’s their dream. You have to let them do it. All we were hoping was that he was safe,” Magis said over the phone from Cranbrook. She has been impressed with how far he’s been able to go in his condition and in such a short period of time. Every place they have walked through has been welcoming and Merchant said it’s been difficult to leave. 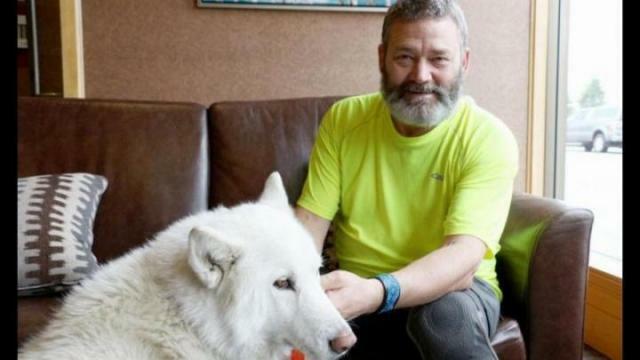 He doesn’t reach out to people, they come to him — it’s difficult to miss a man in a fluorescent yellow T-shirt, shorts and a large white half-wolf dog along the highway. In the Bulkley-Nechako region 40 people came out on the highway to meet him. An elderly woman showed him a photo of her daughter who had been murdered and he was invited to stay at a resident’s home for the evening. During his tour he’s met with five families whose girls have been murdered, and one family whose son is missing. Acknowledging and bringing awareness to the Highway of Tears and the families who are suffering from the loss of a loved one is a key component to his mission. “People just want to be respected as people,” he said. When Merchant was young, his father owned a shoe store business in Cranbrook. His father used to employ the homeless and vulnerable to do odds and ends at the shop. “That’s probably where it starts,” Merchant said when asked why he wanted to do the walk. Merchant expected to catch the ferry to Haida Gwaii on Thursday, Oct. 20 after retracing the steps he lost at the 85km sign. “The trip is coming close to an end and it’s making me sad but the journey will never ever in my whole life end,” Merchant said. Merchant is doing a meet and greet on Tuesday, Oct. 25 at 11 a.m. until 1 p.m. at the Rupert Square Shopping Centre before he leaves for Haida Gwaii. He is also fundraising for a First Nations women’s shelter on his GoFundMe page.